Sunflower seeds are the fruit of the sunflower that are eaten roasted and shelled. Sunflower sprouts are packed with nutritional benefits. High in protein and fiber, these greens are also a good source of calcium and iron. Sunflower sprouts are rich in polyunsaturated and monounsaturated fats and are also a good protein source- a complete plant protein, at that. Similar in texture to spinach, the nutty flavor of sunflower sprouts (much like that of sunflower seeds) makes them an excellent addition to salads, stir fry, and smoothies. The sunflower seed, or the fruit of the sunflower, is commonly misnamed when referring to the edible portion. The kernel is what we eat while the seed is the kernel enveloped in the outer hull. 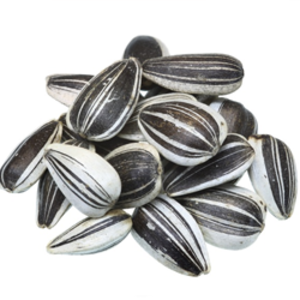 Sunflower seeds are also healthful- high in polyunsaturated fat, sunflower oil is often extracted for culinary uses. These seeds are also high in vitamin E, selenium and magnesium. Their nutty flavor compares to Jerusalem artichokes (which come from the same family as sunflowers). Baseball players cracking sunflowers seeds in their teeth and spitting shells into the bright summer sun as they wind up for a strike-out pitch is an iconic American image. These zebra-striped beauties are popular world-wide however, particulary as a snack in Asia and the Mediterranean. Sunflower seeds with an especially high oil content can be pressed for pure sunflower oil or ground into sun or sunflower butter. Sunflower seeds are nutrient-dense and supply B vitamins, magnesium, manganese, zinc, and Vitamin E. Outside of snacking, hulled sunflower seeds can be sprinkled onto dishes for a final crunch and protein punch. The rich, healthy oils in sunflower seeds go nicely with salty seasonings and strong Middle Eastern flavors like cumin.